(Christian demonology) Stolas is a high Prince of Hell commanding 26 legions of demons. He appears as an owl or as a man who teaches astronomy, the properties of plants, and the worth of precious stones. Stolas is a great prince, appearing in the forme of a nightraven, before the exorcist, he taketh the image and shape of a man, and teacheth astronomie, absolutelie understanding the vertues of herbes and pretious stones; there are under him twentie six legions. 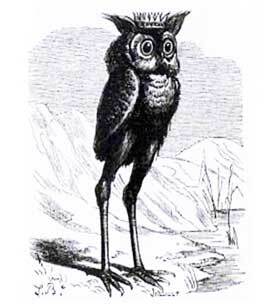 The Thirty-sixth Spirit is Stolas, or Stolos. He is a Great and Powerful Prince, appearing in the Shape of a Mighty Raven at first before the Exorcist; but after he taketh the image of a Man. He teacheth the Art of Astronomy, and the Virtues of Herbs and Precious Stones. He governeth 26 Legions of Spirits. The Stolas demon is a male demon.